The Center for Interreligious Understanding is a 501(c)(3) not-for-profit organization founded in 1992, with Rabbi Jack Bemporad as its Executive Director. Since its inception, the organization operates on the premise that religions have great power and through theological dialogue, we can harness that power for good. To that end, the CIU works with and influences religious leaders of all beliefs by exploring their common goals, as well as their religions’ theological foundations. By creating constructive systems for fighting religious stereotypes and intolerance, the CIU fosters bridges of understanding, reconciliation and peacemaking vital to meeting the interfaith challenges of the 21st century. Over the years, the CIU has worked behind the scenes and diplomatically at the Vatican and at the World Council of Churches, as well as with individual religious leaders and informal religious coalitions of all faiths. Although much of the CIU’s work has been focused on Jewish-Christian relations, the CIU’s vast experience working for interreligious understanding with the Catholic Church is now being used as a model for meeting on common ground with Muslim leaders. The CIU sponsors educational programs, lectures, and talks with policy leadership all over the world, uncovering and illuminating our shared values for good to people of all faiths. 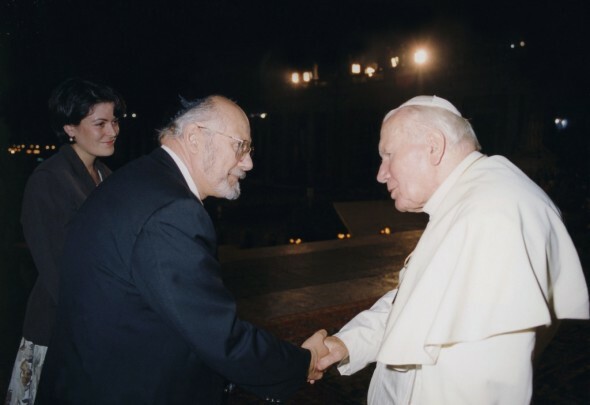 For example, Rabbi Bemporad has advised world religious leaders on theological statements and doctrines, and negotiated the Prague Accord, the first time the Vatican asked forgiveness of the Jewish people for past acts of anti-Semitism. The CIU has also placed Holocaust Menorahs at the Vatican and in Catholic, Protestant and Jewish institutions in Baltimore, Boston, Dallas, Miami and Washington, D.C., New York City and Jerusalem. The CIU analyzes major theological developments through articles, conferences and speeches at leading institutions, such as the United Nations and New York University, and at temples, churches and mosques around the world. The CIU educates academics and laity, as well as theologians, about interfaith issues among Christians, Jews, and Muslims, including sacred texts, Holocaust revisionism and the Middle East. In addition, each year, the Vatican invites Rabbi Bemporad to teach seminarians about Judaism and interreligious cooperation at the Angelicum University in Rome. As a result of its success in breaking down religious and ethnic barriers to peace, the CIU has received the Luminosa Award of the Focolare Movement for Interreligious Leadership. In addition, the CIU received the Pave the Way Foundation’s “Inter-religious Dialogue” award as well as the Shri Chinmoy “Lifting the World” Award, and was honored by the Friends of John Paul II Foundation. Most recently, Rabbi Bemporad was given the Interfaith Dialog Center (Muslim) “Peace and Tolerance” Award.